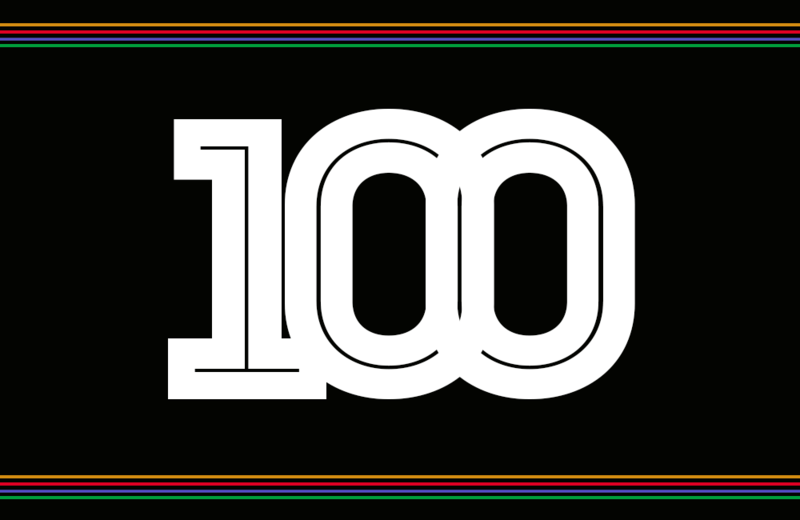 Late 2013, early 2014 we had published a list of 100 Best Young Players to Watch in 2014, the progress of who we’ve been tracking with our detailed Scout Reports and regular Talent Radar features. This Top 20 Young Players of 2014 feature takes a look back at the year and the stand-out performers. As seen above, in addition to a look back at 2014, we’ll also be looking ahead to 2015 and the best young players to watch. Note that for this feature only first team games in the top division of leagues, cup & continental competitions plus games for the senior national team have been taken into consideration. Figures mentioned in brackets are those of their positions in the aforementioned 100 Best Young Players of 2014 list. Who? At just 19, Luke Shaw is a player that has been ear-marked as England’s and Manchester United’s left-back for years to come. Hailing from Southampton’s famed academy, the youngster is already into his 3rd full league season meaning that he’s further in his development than most of his compatriots of the same age. Why? Shaw started the year as a Southampton player and despite the rumours surrounding him in the January transfer window stayed put till the end of the season at least. Having firmly established himself as the first choice left back under Pochettino, Shaw made an impressive 35 starts in the league alone in the 2013/14 season more than satisfying.our Talent Radar criterion of regular playing time. Having sealed a place in Roy Hodgson’s England World Cup squad, Shaw’s transfer to another club became a question of when and not if. As it turned out Shaw secured a move to Manchester United. After overcoming fitness issues, something that Van Gaal was quick to pounce on, Shaw has just begun to show what he’s made of as part of an ever-changing United back line. So what is it about Shaw that has made him reportedly the most expensive teenager in the world? Well for one thing, it is rare to see full-backs display such proficiency in both defensive and attacking capacity in the embryonic stages of their career. Starting with his defensive attributes, he is particularly impressive in one-on-one situations, reads the game well, and displays good pace. In terms of contributing to the attack, he is more than comfortable in possession willing to dribble and take on the opposing full-back but also participate in combination play with his midfielders. His crossing ability is another strength and he is not shy of showcasing it whenever he gets the chance. There are of course aspects of his game that can improve, for instance taking quicker decisions in the transition from attack to defence. He is obviously not the complete package yet but he certainly does look the part and could well live up to the considerable hype surrounding him. The Future? Shaw’s Manchester United career has got off to a less than ideal start as injuries have prevented him from hitting the ground running. In his short career at Old Trafford though, he has produced progressively better performances. For the short term, settling in at his new club and producing consistent performances should be the goal. With no real challengers for his first team spot and under Louis van Gaal, Shaw has an excellent opportunity to continue his development. Who? 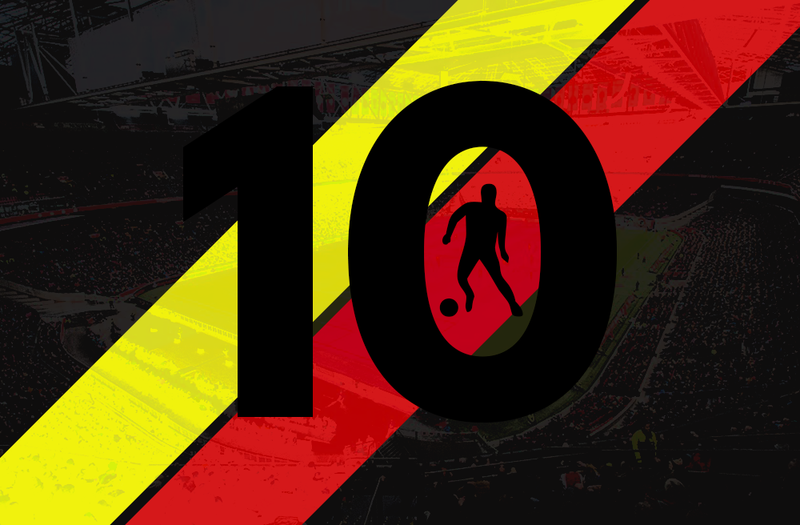 The youngest player on this list of the Top 20 Young Players of 2014, Youri Tielemans is a talented midfielder coming through and establishing himself in the football world. His emergence ensures the golden generation of Belgian football has a prolonged period of success. Why? Anderlecht continue to amaze with their ability to produce top quality youngsters, utilise them in the first-team and somehow manage to remain the dominant force in Belgian football. But if what Belgium has produced earlier that set the stage for them being touted as dark-horses for the 2014 World Cup, Youri Tielemans represents a whole new level of development. The modern deep lying midfielder is already being touted as the next big sensation in World football, and with performances of the sort he’s put in, it’s hard to argue against that hype. Having burst onto the scene initially last season, Tielemans was struggling to nail down a place in the Anderlecht side with coach Besnik Hasi rotating players and enjoying tactical flexibility. It was only in the championship play-offs that Tielemans truly stood out starting and finishing all of the side’s 10 games as Anderlecht secured their 33rd title with a mere 2 point margin over Standard Liege (who had actually topped the regular table by 4 points). At just 17, Tielemans’ creativity is frighteningly brilliant. It’s hard to imagine how a teenager could have been so well developed at such a young age. Preferring to sit in his deeper position, Tielemans thrives on playing long-balls into threatening positions with either foot. And when you think his game is restricted to longer balls when not under pressure, he surprises you by bursting into advanced areas and not shying away from playing shorter more direct passes & touches in crowded zones. The common narrative for a teenager playing professional football would be to declare his abilities as ‘raw’ but Tielemans already looks the finished product. The Future? All the attention can easily effect a players mental state, and the attention will always lead to links with other more established European clubs. A common refrain to this particular situation from our end, one that fits this case perfectly, is that Tielemans would be best suited to remain at the Belgian club for the foreseeable future (by foreseeable we mean till he turns 21), as they continue to impress with their player development; not to mention his development is best explored at a club dominating it’s domestic league (having won the last three). Who? He scores hat-tricks. He gets sent off. If we were to sum up Domenico Beradi’s career in the fewest words possible, that would be it. In his short career ranging from the Serie B to Serie A, Berardi has scored an incredible three hat-tricks while also having been shown a straight red three times already. Why? Berardi first made waves when he struck the first hat-trick of his senior career against Sampdoria; but followers of Italian football were always singing praises of his ability while also questioning his obvious temperamental issues long before that. But the man currently on loan from Juventus couldn’t have had a better start to the year. Sassuolo were on a run of 5 games without a win (and would follow this particular game with 8 more performances that lacked three points at the end), when ex-boss Max Allegri brought his AC Milan side to town. What followed quite shocked viewers. The away side were 2 goals up in the opening minutes and looked to be cruising until Berardi struck a sumptuous first-half hat-trick and added to it two minutes after half-time to manage a four-goal haul in just over half an hour. The issue is that for every good performances, there’s going to be those avoidable moments that cost the team. A month or two after that Milan demolition, he came on against Parma and was shown a straight red 48 seconds later following a clash with Crisitan Molinaro. The second half of 2014 has been no different. Though a return of 9 goals or assists in 10 games is a stellar job, Berardi once again found himself sent-off in Sassuolo’s 7-0 loss to Inter. But for all his baggage, the talent possessed by Berardi means that he is certainly worth having in your side. Though not the most pacey player, Berardi certainly is quick in terms of his decision making and reactions. His hard-work ensures he’s always onto the first ball and defensive lapses, and his quickness in mind allows him to always find a shot when others may have preferred a touch or two more. This, complemented with his incisiveness in finishing makes him one of the most prolific young strikers. 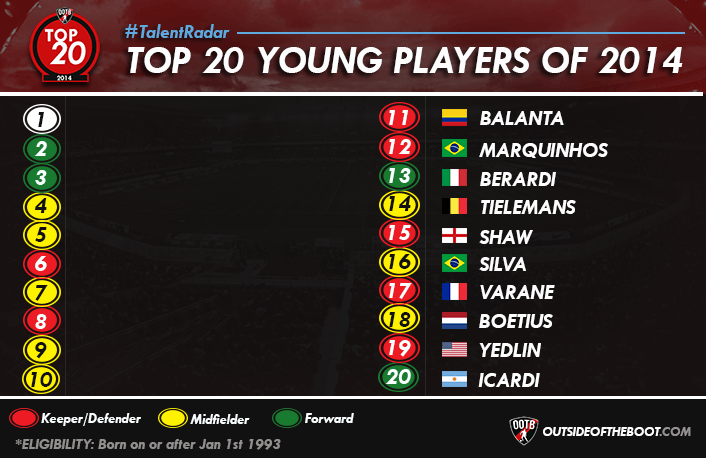 Berardi was named in our Team of the Season and given the award for Performance of the Season at the 2013/14 Talent Radar Young Player Awards. The Future? More of the same would be fantastic but not ideal. His ability to find the net can keep sides going, but the pressure he puts his team-mates under with his lack of self-control is something that can cost his overall progress dearly. This negative factor may eventually prevent his parent club from fully utilising him, as a player of his ability, should be playing regularly at a club of Juventus’ stature. Who? One of the most highly rated central defenders while in Brazil before his European move, Marquinhos is a balanced fusion of a throwback to defenders of a previous era and one of the modern day. Kept out of the Brazilian national team thus far by his two PSG team-mates, he finally seems to be getting recognition with the Selecao. Why? It was a difficult start to 2014 for Marquinhos, kept on the bench as a Brazilian combination of Thiago Silva & Alex was preferred in the heart of the defence. But it was the performances he delivered when given the chance to do so that truly spoke of his quality. Though the lack of regular game time failed to convince Luiz Felipe Scolari in naming him in his World Cup squad, instead sticking with those he relied on earlier. He did however manage to convince us as we named him in our Talent Radar Team of the Season 2013/14 (link above). This lack of opportunities didn’t seem to end soon as PSG roped in David Luiz for an astronomical amount, but injury to captain Thiago Silva paved the way for an extended run in the first-team for Marquinhos. An opportunity he took with open arms, impressing with a series of displays to remind the World of just how good he can be. The simple factor that sets young central defenders apart from others and be considered good enough to make a list of this sort is the unbelievable level of intelligence displayed in understanding the game. Marquinhos is no different and his sheer reading of the game at 19/20 is frightening and leaves most viewers asking just how much better can he get with him yet to reach his peak. His experience of playing in a wider role often allows him to seamlessly be involved in general outfield play far more than most defenders would, and you’d often expect a defender of that sort to leave gaps and disrupt organisation at the back; surprisingly again this is rarely the case owing again to his defensive intelligence. The Future? All the talent and ability in the World won’t get you anywhere unless regular game time is awarded. The 20-year-old is currently kept out by the same two players at both club and country, both of whom aren’t exactly past their prime yet. While regular football in the national team at 20 is always a difficult task, one would expect that as a bare minimum at club level. Though there are no imminent signs at the moment of a potential transfer, but it increasingly seems like a crowded PSG is not the best club to develop at; not at the moment at least. Who? River Plate’s 21-year-old Colombian centre back Eder Alvarez Balanta is already one of the best defenders in South America and one of the hottest prospects in world football. Looks set to follow in the footsteps of Ivan Cordoba and Mario Yepes to be one of the pillars of national team for years to come. Why?Balanta has all the attributes you could wish for in a modern defender. Powerfully built, strong in the tackle and dominant in the air, he is also very rapid across the ground and, having played further forward as a youngster, is comfortable bringing the ball forward. He really is the complete package. Having only made his professional debut in April last year, 2014 continued the rapid upward trajectory of the young Colombian. Balanta was a key player in River’s Torneo Final victory and he was duly rewarded with a place in Jose Pekerman’s World Cup squad, making one appearance in the 4-1 victory over Japan. Due to an injury and the form of Ramiro Funes Mori and Jonathan Maidana, Balanta has only featured intermittently during the current short tournament but this minor blip shouldn’t be treated too seriously as he can look back at a solid year of development. The Future? It was somewhat surprising that Balanta didn’t move during the summer transfer window as he was linked with numerous top clubs across Europe, with Valencia and Porto strong contenders for his signature. A player of Balanta’s quality and promise will not remain in Argentina much longer and it wouldn’t be surprising to see a club swoop for him in January. River seem to be holding out for a big money move but they won’t be able to hold onto their prize asset for long and there will be no doubt that Balanta will be turning out for one of Europe’s elite by next summer at the very latest. It will certainly be an important year for Balanta. Along with establishing himself as Colombia’s first choice centre back ahead of the Copa America – which the Cafateros have a real chance of winning – he will have to adapt to a new country and style of football when the inevitable move does come. If he keeps doing what he’s doing now, then the sky really is the limit. Co-founder and Chief Editor here. Obsessed with tactics. Keen follower of young players. 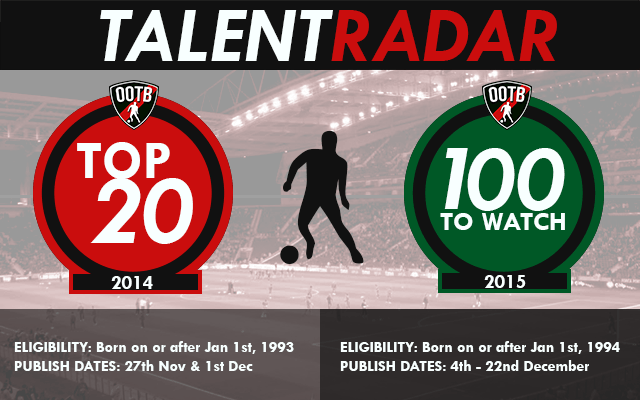 Creator of #TalentRadar.